Six weeks ago, I gave up dairy to see if it helped with Georgia's fussiness. At first, I honestly didn't know what to eat. My meal plan was largely built around cheese...halloumi salad, broccoli cheese muffins, mexican, tortellini. not to mention coffee. With Milk. A lot of milk. Those first few days were really hard. I was hungry all the time. I was afraid to eat out, for fear of not being able to reliably find anything I COULD eat. I bought and tried every kind of alternative milk product on the market. As soy is often linked to dairy allergies, that was out. And black coffee is not for me. A few weeks on, I was getting in the swing of it. I had found that coconut milk makes a tasty coffee and my meal plan has a definite Mediterranean feel to it. At the same time, we realised that part of Georgia's grumpiness was that she wasn't getting enough sleep and couldn't be awake for more than an hour and twenty minutes at a time. The transformation was astounding. Georgia went from a fussy wee thing to an extremely happy chilled out little girl. Wanting to see if it was the sleep or the dairy that was improving her mood, I added a generous handful of cheese to my dinner one evening. The next morning, unsurprisingly, Georgia woke up a rather unsettled little girl. Dairy was definitely out for her. Rather more surprisingly was that I also woke up with terrible stomach cramps. I felt sluggish and awful all day. I realised it wasn't the first time I felt like this. In fact, MOST mornings, prior to giving up dairy, I woke up with stomach pains. I just thought it was 'one of those things'. It seems that dairy is out for me too. When embarking on this 'experiment', that is all it was. A few weeks, months, maybe a year until I could happily eat dairy again. However, it seems that my future is now dairy free. It amazes me that something I have eaten every day of my life can be so bad for me. And of course, its in everything, so not only am I not eating dairy, but things like cakes, chocolate and the like almost all have milk in them. And many of the non-dairy alternatives are filled with chemical alternatives that I do not particularly want to eat. So my consumption of those things is essentially non existent. In fact, I only have a few teaspoons of sugar a day now (in said cup of coffee). Most of all, I feel great! Fewer mood swings, more energy. Unintended consequences, but we are all better for it. 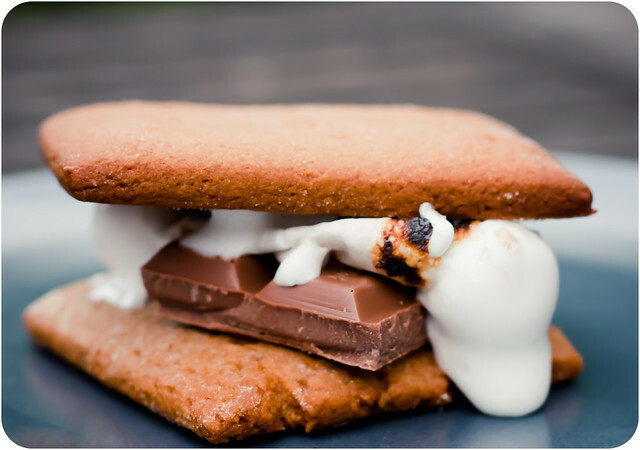 The photo above is of one of the s'mores we made at the weekend with homemade graham crackers. Yes, it has milk in it. Yes, I ate one. Yes, we all paid for it. But they WERE good.